This article was first published in John Redwood’s Diary on February 1, 2019, and is republished by kind permission. 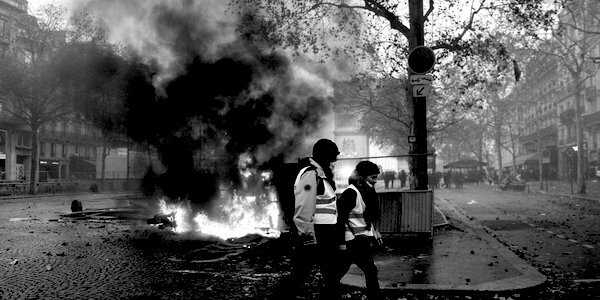 THE news that hundreds or even 2,000 people have been injured in the French protests is worrying. There have been at least ten deaths, according to press reports. There is also a controversy raging in France over the use of police weapons. Officers are allowed to use guns that fire large rubber bullets, and to release grenade-type crowd control devices which contain explosives and scatter more rubber bullets on detonation. There have been cases of people losing part of their hand from these explosions, and reports of blinded and injured eyes from the bullets. It also seems to be true that the police have suffered injuries. The gilet jaune protests began against high and rising fuel taxes. The symbol and uniform of the protesters is the gilet jaune (yellow vest) which all car drivers have to carry in their vehicles to wear in case of emergency. It is an irony that a protest which is part about the pressure on motorists should use as its symbol an item of clothing demanded by a regulatory requirement. It makes it impossible for the authorities to ban carrying such items or using them by displaying them prominently in a car as a symbol of support for the movement. Meanwhile Italy is in recession and Germany had a fall in output in the third quarter, with a weak fourth quarter as well. Economies are crying out for some stimulus. The motor industry has been particularly hard hit by restrictive credit policies and by tax attacks on the purchase, owning and use of vehicles. Changes in EU emission rules disrupted production and sales, and Chinese demand for German cars fell away quickly. Even the UK industry has suffered from all this, which isn’t anything to do with Brexit and has happened before we have been allowed to leave the EU. In the UK, big vehicle excise duty increases, a squeeze on car loans and threats of more bans and taxes on diesel vehicles has cut output and sales and slashed investment. The UK government should put together a better tax and regulatory package to stabilise and improve sales and output before more damage is done.